There are several ways that you can get involved in the work of the Federation. The opportunities for you to participate in activities, to receive and give capacity building events, to represent medical students on international platforms and to attend IFMSA meetings are near endless! The easiest way to get involved is by approaching your national representatives. IFMSA currently has members from over 125 countries. To know if your country is a member and/or to contact your representatives, consult the page of Our Members and select your country! We have several open mailings list that you can join to stay updated about the work of the Federation. Find it all about it here. IFMSA has recently established a set of programs on a variety of cross-cutting topics. It aims to support the work done on the local and national level by members. It is very easy for one to get enrolled in a program, and to beneficiate from many resources that IFMSA has. To discover more our Programs and the various related opportunities, visit Our Programs section. 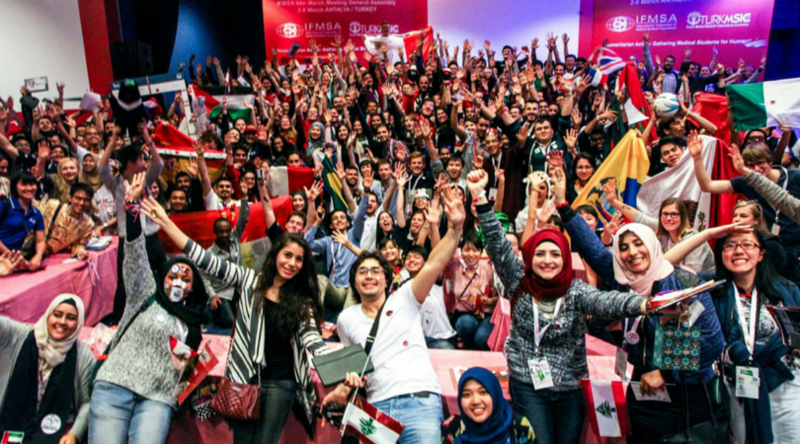 IFMSA hosts two General Assemblies and five regional meetings in each of its defined region (Americas, Asia-Pacific, Africa, Europe, Eastern Mediterranean) every year. Medical students are invited to participate by taking part in their National Member Organization (NMO) delegations. Information about the most recent meetings is available on Our Meetings section. To learn how to attend one of our meetings, contact your respective NMO. Very often, IFMSA offer medical students the chance to represent the voice of the Federation to regional, global and high-level meetings, such as the World Health Assembly, UNESCO Forum, the Association for Medical Education in Europe, and many many more. All are invited to apply to be part of an IFMSA delegation. All information is shared on Policy and Advocacy – Delegations Section. One of the core pillars of the Federation is capacity building, and as such, several opportunities are created for medical students to practise their skills as trainers in the field of leadership, communication, group management, etc. Visit our Training Resources Center to know how to and when you could receive and/or give a training, and to be informed of upcoming capacity building events. With more than 13.000 professional and research exchanges each year, IFMSA allow many medical students to experiment medicine and healthcare delivery in a variety of countries around the globe, while allowing themselves to become more culturally sensitive health professionals. Why wouldnt you Exchange the World this year? You have been involved in IFMSA some years ago, and now would be interested in giving back? We have several opportunities for you. Learn what you could do on Our Alumni section.